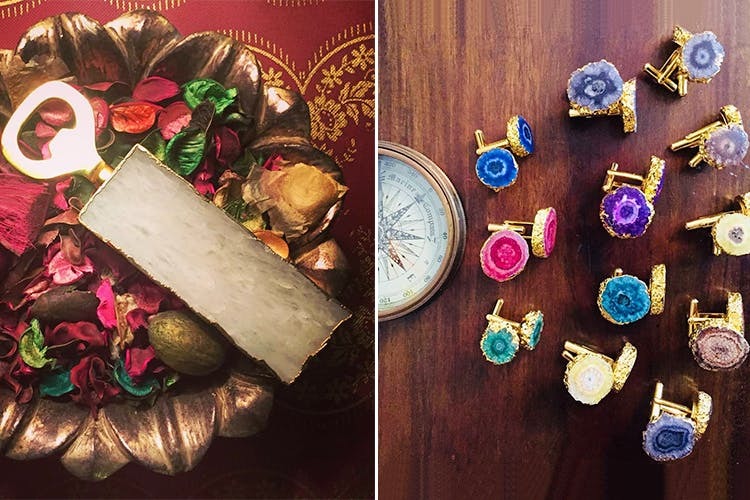 Verandah is using beautiful, Agate stones to create men's accessories, keychains, rakhis, bottle openers and more. Their unique designs make for attractive, one-of-a-kind gifts. Their use of colourful Agate stones makes their products look unique and pretty. Their use of bright stones and gold-plating for men's accessories is something we especially liked about them. They've come out with colourful cuff links, rings and lapel pins that add a splash of colour and really make your outfit look dapper. They definitely make looking for gifts for men a whole lot easier. Another one of the products we liked is their bottle opener, with a massive stone in the middle and gold-plating all around—it's a great accessory for your bar. If you're someone who lives for collecting unique products, their stuff will definitely make the cut. They've also got really cute rakhis, too, which we're liking much more than the usual sort of stuff we see every year. They're also doing personalised products (like names and initials) on their keychains. We wish they had accessories for women. They do mass gifting, in case you're looking for party favours to give out.